Time for a final update on an old friend (and nemesis) of mine, Christine. Christine was my previous motorbike, a 1979 Kawasaki KZ650. 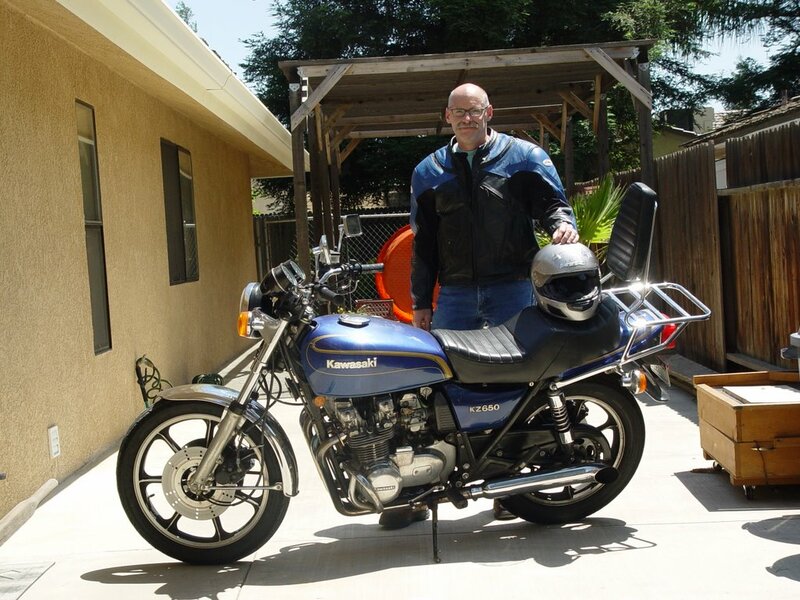 I bought that bike about a year ago from an optometrist in Palm Desert. He wasn't too mechanically inclined, and the bike needed some (more than some!) work, but the bike was fundamentally sound, and the price was right. Fuel cost for driving the truck to work was killing me, and I also just wanted some exhiliration. So I brought the bike home and started commuting on it. At first I nearly crashed because the rear tire was so worn that it was squared off. As I got comfortable riding it and approached a curvy section of road, it started behaving erratically. First it wouldn't turn enough, then it turned too much! The rear tire was going up onto the "corner" between the sidewall and the flat spot where the tread was worn out. Scary! After figuring out the handling problem, I decided to remove the rear tire myself and just take the rim into the motorcycle shop for tire replacement. I humped the bike up onto the center stand and pulled all the hardware off to remove the rear wheel. Turns out the bike wasn't up quite high enough to get the rear wheel out from under the fender. So I lifted the bike some more, kicking the wheel while supporting the bike. The bike rolled forward off the center stand, and fell to the ground without a rear wheel under it. On the way the exhaust pipe gouged a nasty gash in my shin, and afterwards it fell against the house, damaging my new stucco job. After telling a friend this story, he said I should name the bike "Christine" (after the posessed car in the Stephen King novel). After getting the new tire, Christine handled quite well. Very forgiving, predictable, and manageable. Not too fast though. She was heavy >500 lbs, and not too powerful, at 68 hp. But she was good enough for a commuter bike at 40 MPG - when she ran. One day on the way home I stopped at an intersection, and when I tried to take off, the engine revved, but the bike went nowhere... like the clutch was pulled in. And I heard an odd metallic clinking sound. Not promising at all... So I picked up my truck and hauled Christine home. The front sprocked retaining nut had come loose and the front sprocket had fallen off the shaft. The metallic noise I'd heard had been the shaft spinning against the sprocket. No big deal - except the bike was down for a week while I waited for the replacement nut/lockwasher, and I was back to driving the F-250 4x4 with crummy mileage. There were a series of events where the bike slowly lost power and then eventually died and left me at the roadside. It was all fuel delivery - I could usually get it to run if I shook the bike around and sloshed fuel in the tank. It always seemed to happen when I was low (less than half a tank) on fuel. It also leaked fuel overnight out the carb overflows. I eventually figured out that the fuel petcock was sticking. It was supposed to open with engine vacuum, and close when the engine shut off. Instead it would stick open when the engine was off, overflowing the carbs. Worse, it would go shut at wide open throttle (low engine vacuum), and wouldn't re-open when engine vacuum returned to normal. It stranded me a lot until I got the petcock issue figured out and repaired. When the petcock rebuild kit arrived, I repaired the petcock but also decided to clean out the gas tank. I took it to work and ran a lot of water through it to rinse out any sediment, then I blew lots of air through it to drive off any moisture. One of the hoses I used must have been contaminated with something though. 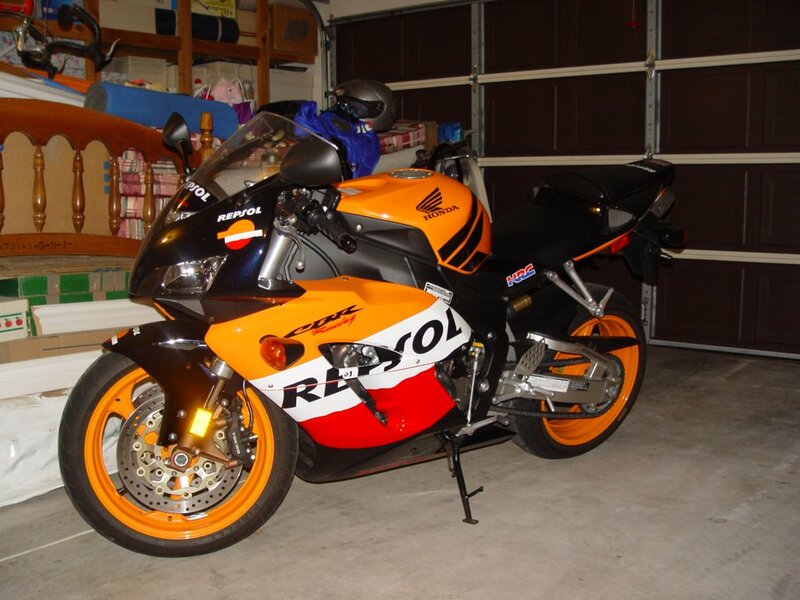 When I refilled the tank and started the bike, it barely would run, and it smoked like an old diesel engine. I wasted that entire tank of gas, and another gallon of gas that I used to rinse out whatever solvent or oil had gotten into the tank. I decided to make Christine more pretty. I got rid of the silly fairing. Added cool blue LED bulbs to the speedo and tachometer. Put LED bulbs in the turn signals after one of them burned out. Replaced the side panels. Polished some of the rustier parts. Fixed a couple of oil leaks. Replaced the aluminum phillips screws with stainless steel allen head screws. I was able to make her accelerate quite bit faster by advancing the timing and adjusting the points. The points were totally out of adjustment. It's amazing that she was even firing on two of the cylinders. I bought a shim kit and valve cover gasket with the intention of adjusting the valve clearances - she had a tendency to backfire a bit, and I'm pretty sure that it was from one or more exhaust valve(s) hanging open. And then the second to the last 'event' occurred. She died on me on the way home from work one morning after night shift. Just bogged down and sputtered to a stop. I realized that she had no juice. None of the lights was on, indicating a charging problem. So I checked the alternator coils and they seemed about right. I bought a rectifier/regulator to replace the seemingly faulty one. No dice. So I did some further investigation and learned that maybe the alternator coils had a partial short. I ordered an upgraded aftermarket alternator. It was a really nice three phase winding with a full three way bridge rectifier. The stuff took a frigging month to show up. A beautiful riding month during which I was driving a truck with awful fuel mileage. While waiting for the parts to arrive, I cleaned the contacts in the ignition switch, as I learned that voltage drops through that switch can make the voltage regulator think it's delivering more voltage than it really is, causing its output to go low. Whatever the charging problem was, it was corrected by the new alternator and/or cleaning the ignition switch. The next evening I rode it to work for the first time in a month - and for the last time ever. I was happy to note that the headlight was *way* brighter, as were the gauges. A co-worker coming off day shift with a truck picked up me and my bike (once again) and I spent part of the night at work trying to free up the engine with penetrating oil in the cylinders and a 36" pipe wrench on the balancing wheel. I must have slagged it down pretty good, because it never budged. Hahahaha. There may be another KZ in my future, and maybe not. It's been fun getting back into motorbiking and I certainly enjoyed Christine when she was running.